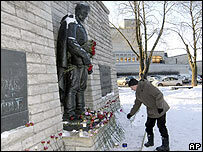 Estonia's president has refused to sign a controversial law that would pave the way for removing a Soviet war memorial. 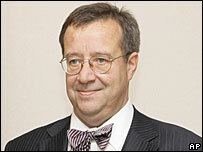 Toomas Hendrik Ilves said some sections of the law were unconstitutional. Earlier on Thursday the Estonian parliament passed a bill obliging the government to remove the monument within a month. The "Bronze Soldier" has become a symbol of divisions in Estonian society. Ethnic Russians are firmly against the plan to remove it. Most of the country's large Russian-speaking minority regard the statue as an anti-fascist symbol, but for many ethnic Estonians it honours a regime which occupied the country for more than 50 years. Russians form about one-third of the Baltic republic's population. President Ilves accused some MPs of "irresponsible behaviour"
Mr Ilves accused some Estonian politicians of using the issue "merely to draw attention to themselves" ahead of the 4 March parliamentary election. Russian Foreign Minister Sergei Lavrov, quoted by the Interfax news agency, called the Estonian MPs' vote a "very big mistake and an act of blasphemy which is unacceptable in today's Europe". The law would prohibit the display of monuments glorifying Soviet rule, which ended in 1991. Mr Lavrov's deputy Vladimir Titov warned that approving the law would have irreversible consequences for relations with Estonia. After clashes between ethnic Russian and Estonian activists at the statue, the Estonian government said it wanted to move the monument - and the soldiers' remains thought to be buried beneath it - to a more suitable location. Prime Minister Andrus Ansip said the government would be able to order the monument's removal anyway, using a law on the protection of war graves which was passed in January, the BBC's Laura Sheeter reports from Tallinn.